WASHINGTON — Democrats are on pace to have the largest presidential primary field in campaign history and its growth shows no sign of slowing. As of Friday, there are at least 14 major candidates in the race — 17 if you count three other semi-well known contenders — and almost half dozen others who are expected to announce soon. It's difficult to make precise comparisons, since analysts debate about who counts as a "major" candidate. But without a doubt, the 2020 crowsis on par and likely to exceed the biggest presidential fields of all time, including the 2016 Republicans, which had at least 17 candidates, and the 1976 Democratic field, which had 16. So what are Democrats to do with so many choices? "This reminds me of the menu at a Cheesecake Factory: utterly overwhelming and nothing particularly stands out," said Grant Woodard, a Des Moines trial lawyer and former Democratic operative. On April Fools' Day, the Des Moines-based Polk County Democratic Party announced it would have to expand a long-running one-day event to accommodate the huge field: "2 many candidates? 2 day Steak Fry!!!" It was plausible enough that some initially believed it. After all, the Democratic National Committee was not joking when it took the unprecedented step of expanding its first debate over — to make it over two nights to accommodate up to 20 candidates (10 each night) — and it has a contingency planin place should there be more than 20 legit candidates and it needs to winnow that field to keep the debate number at 20. NBC News is hosting the debate, set for June 26-27 in Miami. Of course, not many of the candidates — perhaps not even most — got in the race thinking they could really win, though none would admit so on the record. Some are running to push a specific issue they worry would not get enough attention otherwise, or to build a national profile and get more exposure or to set themselves up for some other office down the road, such as vice president or a Cabinet post. Some experts worry all these options will lead voters to choice overload, decision fatigue and anticipated regret, which is like getting buyers' remorse before you even make a decision because you worry you'll get it wrong. "We all want candidates to choose from, but we don't want to work that hard on it, particularly for people like me who are not political experts," said Lilly Kofler, the U.S. director of behavioral Science at Hill Knowlton Strategies. "It's the paradox of choice." 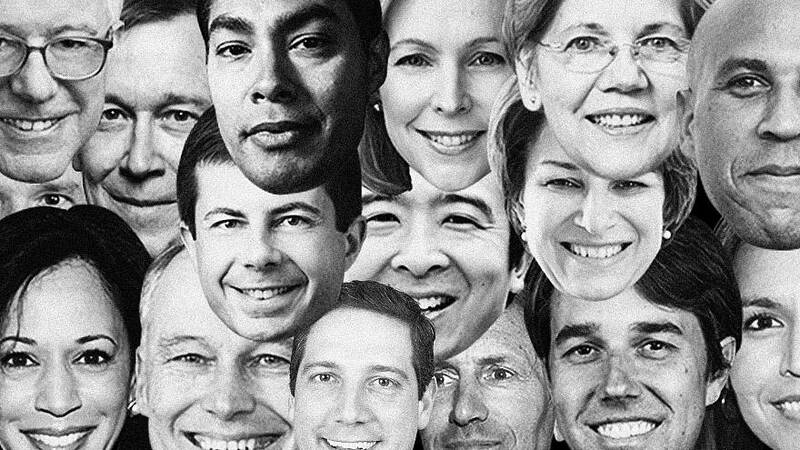 Kofler, who recently wrote an essay for Politico magazine titled,"Too Many Democrats Are Running in 2020, According to Science," said that when people are overwhelmed by choices, they often default to a known option, even if it's not necessarily their favorite one. She argued that President Donald Trump benefited from that effect in the crowded GOP field. Republicans, meanwhile, see the potential to pit candidates against each other in ways that could pay off for their party down the road. "It gives us the opportunity to create chaos every single day," said Sarah Dolan, the executive director of the opposition research group America Rising. "They're making our jobs easy." But Charlie Cook, a longtime political analyst and founder of the Cook Report, doubts that a long, crowded primary season necessarily spells trouble for the Democrats, noting Trump won in 2016 and so did Barack Obama in 2008. As Cook sees it, there's never a shortage of presidential ambition in Washington and state capitals, so large fields aren't uncommon and parties wind up with small primaries only under two conditions. First, if the party thinks it has little hope of winning the general election, so candidates don't bother running. And second, if one candidate seems close to invincible, like Hillary Clinton did in 2016, keeping people like former Vice President Joe Biden and Sen. Elizabeth Warren, D-Mass., on the sidelines. But today, all the ingredients are there for a truly massive field: A not-very-popular Republican president seen as beatable; no prohibitive Democratic frontrunner; new fundraising opportunities online; and a logjam of eager Democrats who have had little room to move up in a party dominated for the past decade by Obama, Hillary Clinton and to some extent Nancy Pelosi in the House. "You've just got a lot of pent up ambition that was waiting to explode," said Cook. "And who the hell knows if you're going to have a viral fundraising moment? Lightning can strike." And there are still more Democrats readying to get in. Rep. Tim Ryan, D-Ohio, officially entered the race Wednesday. Close behind him are fellow Reps. Eric Swalwell, D-Calif., an outspoken member of the Intelligence Committee, and Seth Moulton, D-Mass., a combat veteran known for being a critic of Pelosi. Montana Gov. Steve Bullock, who has recruited brand-name Democratic operatives to help him think through a potential bid, including former Hillary Clinton communications director Jennifer Palmieri, is waiting for the state legislative session to end in May. Sen. Michael Bennett, D-Colo., said this week he's still preparing to run for the White House despite being diagnosed with prostate cancer. Terry McAuliffe, who converted a long career as a political fundraiser into a successful term as Virginia governor, is getting closer to a decision, too. And so is progressive New York City Mayor Bill de Blasio, who's in early-voting Nevada this weekend to meet with politically influential unions, could jump in. Stacey Abrams, the African-American rising star form Georgia, meanwhile, is deciding whether to run for president, Senate or do something else. Then, course, there's Biden, who was spotted this week outside his childhood home in Scranton, Pennsylvania, possibly filming a campaign launch video. This coming wave of white men (minus Abrams) has some Democrats wondering if the 2020 field really needs any more of them. "Timing matters," said Adam Green, the co-founder of the Progressive Change Campaign Committee, which is backing Warren. "The decision to get in now, with such a diverse and solid set of people running, requires an extra belief that 'only I can fix things' — which all white male candidates should seriously gut check."